In August 2009 The Hanleys’ Village Society was awarded a grant of £49,700 by the Heritage Lottery Fund to explore the archaeological landscape and history of the parish. Much of this work will require the services of volunteers and to help them a series of training days and half-days will be arranged covering finds analysis, interpreting old deeds, understanding enclosure records and digitised mapping interpretation. Pupils of Hanley Castle High School and St Gabriel’s Primary School have collected pottery fragments on two field walks in areas north and south of Quay Lane and their finds are being analysed by the Worcestershire Archaeology Service. A geophysical survey of the fields north and south of Quay Lane has been carried out by Stratascan Ltd. It indicated several areas where excavation might reveal evidence of Roman occupation, including ditched enclosures and a possible fortified farmhouse. But trench excavation cannot be carried out until the autumn of 2012, as the fields concerned are under intensive cultivation. The Heritage Lottery Fund has granted an extension of the project until the end of 2012. In the meantime, the Society plans to dig test pits in the gardens of some of the older properties in Hanley Castle and Hanley Swan – half this November and the other half in November 2011. In June 2010 the Society published The Hanleys – a history of Hanley Castle and Hanley Swan by Malcolm Fare. Including 150 old photographs and many accounts of what life in the villages was like in the past, it has been distributed free to every household in the parish. Additional copies are available at £10 from Hanley Swan village stores. A team of volunteers has been transcribing the Enclosure Award, which records the ownership and boundaries of some 460 plots of common land that were enclosed by an act of parliament passed in 1797. A spreadsheet summary of these records is being prepared for passing to the Worcestershire Historic Environment Service, which will then carry out the digitisation project to show what has happened to the various plots today and how the land use has changed. The Society has also transcribed all the census returns for the parish of Hanley Castle from 1841 to 1911 and these are now available for inspection on the website. Thanks to the expertise of Dave Morton, this website has been enhanced and simplified to give every interest group in the parish access to their own page. In November 2010, the first of two groups of 12 1-m square test pits were dug by pupils of both Hanley Castle High School and Hanley Swan Primary School, together with adult volunteers, to investigate the history of the parish by focussing on areas where occupation has been historically established and still continues today. County archaeologist Derek Hurst provided the Society with a detailed report on each site. More than half the sites revealed 13th-14th century pottery – considerably older than the associated buildings – reflecting that many sites have continued in occupation over a long period. The large quantity of medieval building material found, including roofing tiles, confirms the importance of Hanley as a centre of pottery making until the mid-17th century. Highly fired slightly defective tile and brick ‘seconds’ found suggest local recycling of material from dismantled kilns, since seconds would have been used close to the point of production. In total, 4133 finds were recorded, 36% being shards of pottery, 26% roof tiles, 16% bricks and mortar and the remainder pieces of bone, ash, slag and clay pipe. The majority of finds were late medieval (1450-1650) and over half of them were found in just one pit at Horton Manor. This extraordinarily productive pit was located not far from the front door of the manor house. It yielded over 2000 finds, among them a single Roman shard – the furthest west that Roman pottery has been found to date in the parish. Apart from a few 13th-14th century fragments, there was no evidence of further activity on the site until the later medieval period. Overlying that was 30 cm of 17th-18th century deposits, including numerous pieces of clay pipe and some fragments of decayed green bottles; on top of that was 50 cm of 19th-20th century material. The base contents of the test pit, with many pieces of 2-inch thick brick, probably correspond to the construction of the house. Building debris at higher levels (and later periods) may represent refurbishments. There was an intact chronological sequence from the 15th-16th century up to the 19th century, with the lowest level below that of the manor house, suggesting an accumulation of material thrown into a moat. Individual items of interest included crude (late medieval) floor tiles/paviors up to 1½-inches thick and a wide range of fine 18th century pottery, indicating that the inhabitants enjoyed a wide variety of high quality ceramics at this period, more typically to be expected at a town house. 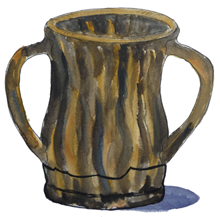 Artist’s impression by Glynis Dray of a late 15th/early 16th century drinking vessel, glazed inside and out, probably double-handled to allow ale to be passed round. Base found at Yew Tree Cottage, Hanley Swan. For further details about the Hanleys Village Society, please visit the main Village Society page. This entry was written by Malcolm Fare, posted on Aug 21, 2010 at 6:13 pm, filed under Clubs and Societies, Village News, Village Society. Bookmark the permalink. Follow any comments here with the RSS feed for this post. Trackbacks are closed, but you can post a comment.